The search engine Ask.com added a new service on Tuesday to “help consumers seek out coupons for saving money when shopping online”. The new service, Ask Deals, helps users search the Web for deals available by aggregating the best offers to a proprietary database of more than 1 million offers from national and local merchants. I was surprised to find, however, that the “Deal$” link was not yet showing in my iPhone when I went to Ask.com – which defaults to the mobile version of the site. However, once you search a phrase from the iPhone, the next screen gives you a standard HTML version of Ask.com, and you then will see the “Deal$” link. But I would’ve guessed that it would show on the mobile version’s homepage – perhaps that update is coming. Ask has added features such as helping consumers share coupons and deals through email and social networks like Facebook and Twitter. 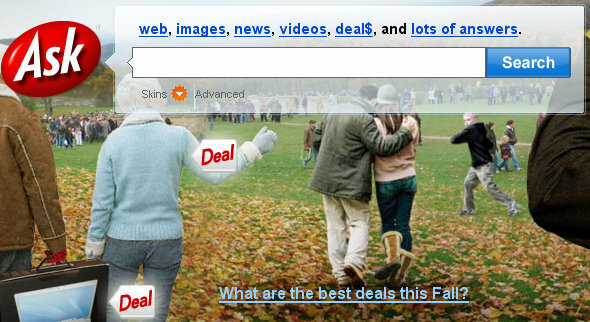 Users can also sign up for “Deal of the Day” emails. The majority of Ask’s revenue comes through a search advertising partnership with market leader Google Inc, which brings up links of relevant advertisers in response to a user’s search query. The Ask network was the fourth most-used search engine in the United States with a 3.9 percent share of all search queries in August, according to Web measurement firm comScore. Google had 64.6 percent market share, Yahoo had 19.3 percent share and Microsoft’s new Bing search engine had 9.3 percent share.